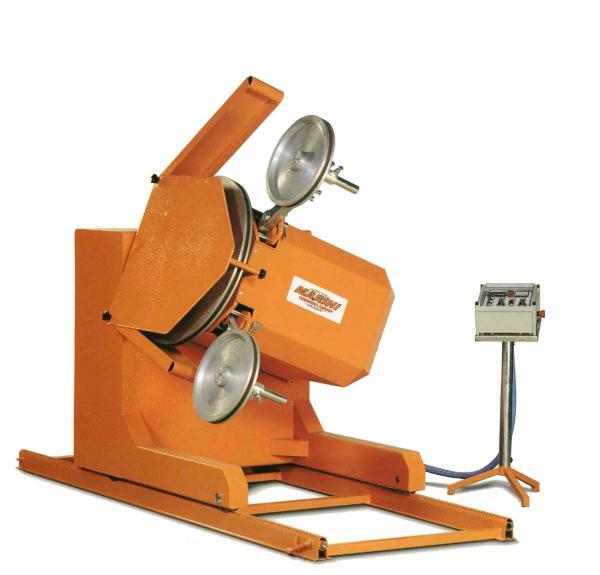 Diamond wire sawing machine equipped with a 50HP electric motor and an inverter, which allows to vary the linear speed from 14 to 30 m/sec. The backward speed is controlled by a special electronic divide as a function of cutting stress which values are pre-selected in order to keep a constant tensioning on wire and to stop the machine and flywheel rotation in case of malfunction or wire breakage. Auxiliary motors controls a quick machine movement on rails for positioning, the 360°rotation of main flywheel (diam. 960mm), lateral movement (stroke 500mm) and the device for the linear wire speed variation. A special device allows to increase greatly the torque during the start-up of diamond wire. The control panel, controlling all principal functions, can be positioned at distance from working area. 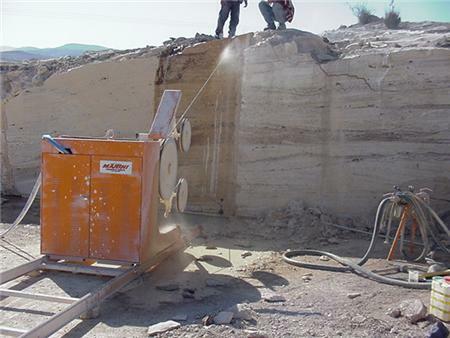 The machine is supplied with 2 tracks of 3m length each.